← Will PAC-Man Gobble Up The King’s English? The following is a little, tiny post I put up after being on WordPress one month. This was before I had pictures, tags or readers. Who of us didn’t have these thoughts in the beginning – and still do, on occasion? Now that I’ve been doing this blog for a month, I must say it’s rather strange. Like writing in your diary, then deliberately leaving it out on your bed for your obnoxious little brothers to read. No offense to MY brothers. Bill, Pat and Jim would never have read my diary. Only because I didn’t have one. Not only are you OK with your little brothers reading your diary, you hope they will. You wish they would tell their friends. And their friends. And their friends. Until a couple of thousand people are huddled under the pink ruffled canopy on your chenille-covered twin bed, avidly reading how you have a mad crush on Donnie Riker. By the way, that’s just a made up name for the sake of illustration, and has nothing whatsoever to do with the kid by the same name whose locker was right next to mine in 7th grade. Really. This entry was posted in General Ramblings and tagged blogging, humor, musings, postaweek2011, writing. Bookmark the permalink. That’s quite the fancy bed you had! Didn’t every girl have that bed? Um, no. 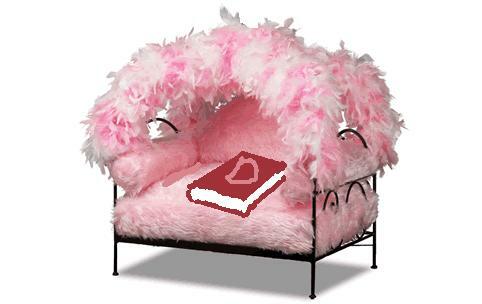 I was anti-pink and had a blue room and a frill-free bed. Anti-pink, hmm? Always a rebel, aren’t you? And look how far you’ve come in one year! Maybe not a comet, but it is interesting. Things really picked up, after hours and hours of frustrating trial-and-error, when I finally figured out how to upload pictures. Wasn’t that a milestone – somebody who didn’t have to read your blog or risk your wrath at the next family dinner? You nailed it. (Only, I don’t tell my family where to find my blog.Their loss.) I think our blog stats are a lot like money: you don’t discuss your income/stat numbers in polite company… Some have more hits or followers than others, a form of personal wealth. You don’t share with your family? Several members are loyal readers, which I really appreciate. Others…not so much. Which I don’t resent as proof of what a low opinion they have of me, and evidence of a selfish regard only for themselves and their own, silly concerns. Really. I like my privacy. In public and on the web. I’m with Spectra here, friends and family know I do a blog, but they have shown no interest in reading it, they think it’s like Facebook and everyone is just telling each other what they had for breakfast (two slices of toast by the way). No way. I thought this was your diary. You mean it’s an open blog that anyone can read? Donnie, just say you secretly returned my mad, hopeless crush in 7th grade and all is forgiven! That’s so true. Although this was a pretty short post, the toughest thing for me is to edit. I hate to lose one word of bloggy-goodness! (raises Long Island Ice Tea in salute). And now you have a loyal following, girl! I couldn’t imagine a day without reading your posts. Yes, my first posts should probably be deleted. But here we are, warts and beauty marks and all. It’s kind of fun now. It used to be a bit painful. You’ve come a long way, baby! Remember the Virginia Slims endorsement of tennis tournaments way back when? Keep on keeping on, sista. Sure wish I could have joined you on the beach in Chicago this weekend. We had fun at the MSU game and Chase tailgate party. Oh how the time is flying. See you this weekend, when I will most likely, but not for sure, be writing that check for the Biggest Loser in the Family Edition!!! Sure wish I was as successful as you have been. You must be close to the big 50 mark, eh??? I DO remember those ads. Funny to think of cigarettes sponsoring a sporting event. Woulda been funny to see Billy Jean King sucking down a Camel unfiltered betweeen sets. Bring your checkbook to Sista’s weekend. Can’t wait to see y’all! I’m comforted to know that the overwhelming “needy need” to be read is not just me! I usually don’t like to expose that needy need. I know a lot of bloggers who say they only write for themselves and don’t care who reads. To me, it’s like performing on a stage. You feed off the feedback from the audience, and it helps you grow and get better. It’s quite a ride, isn’t it? I’ve met so many people through my blog. I always suspected you had a crush on Donnie Riker. I thought I hid it so well. But the post I wrote “An Affair To Remember”, may have given it away (given the fact that I mentioned him specifically by name). Thank goodness I’m many miles and even more years away from home, where anybody would know either of us. I am so pleased for you….. Maybe anyone reading this would like to visit Scarlett88’s blog, she does not get many visitors..only me I think ! That’s nice of you to help a bloggy friend. Thanks for stopping in, Miss P! The fact my brothers found my diary and teased me relentlessly for the past 35 years is why I keep my blog well away from any of my family. Also there are things on there I’d rather they not know about. I do think some of my post should never have been written but then what’s the point in having an online diary if you don’t use it? I’ve been pretty careful about that sort of thing. The funny thing is, some siblings and in-laws are faithful readers, but neither of my kids or my husband are. That makes them fair game, wouldn’t you say? This is so funny, PegOLeg. If it were not for my blogosphere friends, I would have no readers. Though I have a Mom and 5 siblings, I believe only one of the siblings actively reads my blogs. Family and friends? Meh. Too busy to read my babble. I suppose they get enough of me ‘live’ and in person. Lucky them?! I never thought of it that way. Maybe my family is ODing on me as it is. Hmm. I do know that, for the ones who read, almost every family event is either “Hey, you should write a post about that!” or, fearfully, “Are you going to write about this?”. Like going out partying with a cop. My mom, sister and and two close friends used to comprise my total readership for well over a year. I didn’t really care because I didn’t know any different. Now that I have a steady following of many more than five readers, I’d so miss them if they were gone. That’s so true. At first, you don’t miss what you don’t have. Back then, I didn’t read anybody else’s blog, either. Once you get out-and-about and meet people, they become part of your life!